Chicago is a 2002 American musical crime comedy-drama film based on the stage-musical of the same name, exploring the themes of celebrity, scandal, and corruption in Chicago during the Jazz Age. The film stars Renée Zellweger, Catherine Zeta-Jones, and Richard Gere. 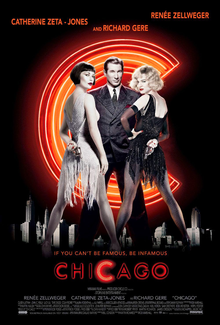 Chicago centers on Velma Kelly (Zeta-Jones) and Roxie Hart (Zellweger), two murderesses who find themselves in jail together awaiting trial in 1920s Chicago. Velma, a vaudevillian, and Roxie, a housewife, fight for the fame that will keep them from the gallows. Directed and choreographed by Rob Marshall, and adapted by screenwriter Bill Condon, with music by John Kander and lyrics by Fred Ebb, Chicago won six Academy Awards in 2003, including Best Picture. The film was critically lauded, and was the first musical to win Best Picture since Oliver! in 1968. In 1924, Roxie Hart watches lead role Velma Kelly perform ("Overture/All That Jazz") at a Chicago theater. Wanting stardom for herself, she begins an affair with Fred Casely, who claims to know the manager. After the show, Velma is arrested for killing her husband Charlie and sister Veronica, after finding them in bed together. A month later, Casely admits to Roxie that he has no showbiz connections and just wanted to sleep with her. Enraged, she shoots him dead. She convinces her husband, Amos, to take the blame, telling him she killed a burglar in self-defense. As Amos confesses to the detective, Roxie fantasizes that she is singing a song devoted to her husband ("Funny Honey"). However, when the detective brings up evidence that Roxie and Casely were having an affair, Amos recants; Roxie furiously admits what really happened and is arrested. Ambitious District Attorney Harrison announces he will seek the death penalty. At Cook County Jail, Roxie is sent to Murderess' Row, under the care of the corrupt Matron "Mama" Morton ("When You're Good to Mama"). Roxie meets her idol Velma, but her friendship is rudely rebuffed. She learns the backstories of the other women there, including Velma ("Cell Block Tango"). On Morton's advice, Roxie engages Velma's lawyer, the brilliant Billy Flynn ("All I Care About"). Flynn and Roxie manipulate the press, reinventing Roxie's identity as an originally virtuous woman turned bad by the fast life of the city; she claims she had the affair with Casely because Amos was always working, but repented and dumped him for Amos, and Casely jealously attacked her ("We Both Reached for the Gun"). The press believe the story; praised by the public as a tragic heroine, Roxie becomes an overnight sensation ("Roxie"). Velma, unhappy at losing the public's attention, tries to convince Roxie to join her act, replacing the sister that she murdered ("I Can't Do It Alone"), but Roxie, now the more popular of the two rivals, snubs her just as Velma originally snubbed Roxie. Meanwhile, Kitty "Go-To-Hell Kitty" Baxter, a wealthy heiress, is arrested for murdering her husband and his two lovers, and the press and Flynn pay more attention to her. To Velma's surprise, Roxie quickly steals back the fame by claiming to be pregnant. Amos is ignored by the press ("Mister Cellophane"), and Flynn, to create more sympathy for Roxie, convinces him that the child is Casely's, and that he should divorce Roxie in the middle of her predicament. Roxie over-confidently fires Flynn, believing she can now win on her own. However, when Katalin Helinszki, a Hungarian woman on Murderess' Row (who happens to be the only inmate to protest and insist on her own innocence), becomes the first woman in Cook County history to be executed by hanging, Roxie realizes the gravity of the situation and rehires Flynn. Roxie's trial begins, and Billy turns it into a media spectacle ("Razzle Dazzle") with the help of the sensationalist newspaper reporters and radio personality Mary Sunshine. Billy discredits witnesses, manipulates evidence, and even stages a public reconciliation between Amos and Roxie when she says the child is his. The trial seems to be going Roxie's way until Velma appears with Roxie's diary: she reads incriminating entries in exchange for amnesty in her own case. Billy discredits the diary, implying that Harrison was the one who planted the evidence ("A Tap Dance"). Roxie is acquitted, but her fame is eclipsed moments later when another woman, who had also shot her own husband, shoots her lawyer just outside the courthouse. Flynn tells her to accept it, and admits that he tampered with her diary himself, in order to incriminate the district attorney and also free two clients at once. Amos remains loyal and excited to be a father, but Roxie cruelly rejects him, revealing that she is not pregnant, and he finally leaves her. Roxie does become a vaudeville performer, but is very unsuccessful ("Nowadays"). Velma is just as unsuccessful, and again approaches Roxie to suggest performing together: a double act consisting of two murderers. Roxie initially refuses, but later accepts when Velma points out that they can perform together despite their resentment for each other. The two stage a spectacular performance that earns them the love of the audience and the press ("Nowadays / Hot Honey Rag"). The film concludes with Roxie and Velma receiving a standing ovation from an enthusiastic audience (which includes Flynn, Morton, the jurors and other acquitted murderesses), and proclaiming that, "We couldn't have done it without you". Renée Zellweger as Roxie Hart, a housewife who aspires to be a vaudevillian, and is arrested for the murder of her deceitful lover. Catherine Zeta-Jones as Velma Kelly, a showgirl who is arrested for the murders of her husband, Charlie, and her sister, Veronica. Richard Gere as Billy Flynn, a duplicitous, greedy, smooth-talking lawyer who turns his clients into celebrities to gain public support for them. Colm Feore as Martin Harrison, the prosecutor in both Roxie and Velma's court cases. Lucy Liu as Kitty "Go To Hell Kitty" Baxter, a millionaire heiress who briefly outshines Velma and Roxie when she kills her husband and his two mistresses. Mýa as Mona, a prisoner on Murderess' Row who killed her artist boyfriend after discovering he had multiple affairs. Chita Rivera as Nicky, a prostitute. Rivera originated the role of Velma Kelly in the Broadway musical Chicago in 1975; her appearance in the film is a cameo. Susan Misner as Liz, a prisoner on Murderess' Row who killed her husband after he wouldn't stop popping his gum. Denise Faye as Annie, a prisoner on Murderess' Row who killed her boyfriend after discovering he was a Mormon with multiple wives. Deidre Goodwin as June, a prisoner on Murderess' Row who killed her husband after he accused her of having an affair. Ekaterina Chtchelkanova as Katalin Helinszki, a Hungarian prisoner on Murderess' Row who insists she is innocent, and does not speak English except for two words: "not guilty"; she is hanged. The film is based on the 1975 Broadway musical, which ran for 936 performances but was not well received by audiences, primarily due to the show's cynical tone. A film version of Chicago was to have been the next project for Bob Fosse, who had directed and choreographed the original 1975 Broadway production and had won an Oscar for his direction of the film version of Cabaret (1972). Although he died before realizing his version, Fosse's distinctive jazz choreography style is evident throughout the 2002 film, and he is thanked in the credits. The minimalist 1996 revival of the musical proved far more successful, having played more than 7,800 performances (as of August 2015[update]), holding records for longest-running musical revival, longest-running American musical on Broadway, and second longest-running show in Broadway history. Its runaway success sparked a greater appreciation of the 1975 original production and renewed stalled interest in a long-anticipated film adaptation, which incorporates the influences of both productions. The original production's musical numbers were staged as vaudeville acts; the film respects this but presents them as cutaway scenes in the mind of the Roxie character, while scenes in "real life" are filmed with a hard-edged grittiness. (This construct is the reason given by director Marshall why "Class," performed by Velma and Mama, was cut from the film.) The musical itself was based on a 1926 Broadway play by Maurine Watkins about two real-life Jazz-era murderers Beulah Annan (Roxie Hart) and Belva Gaertner (Velma Kelly). The George Abbott-directed production, starring Francine Larrimore and Juliette Crosby, ran for 172 performances at the Music Box Theatre, and within a year was adapted to a film in which Gaertner herself had a cameo. Chicago was produced by American companies Miramax Films and The Producers Circle in association with the German company Kallis Productions. Chicago was filmed in Toronto, Ontario, Canada. The courthouse scene was shot in Osgoode Hall. Other scenes were filmed at Queen's Park, the former Gooderham and Worts Distillery, Casa Loma, the Elgin Theatre, Union Station, the Canada Life Building, the Danforth Music Hall, and at the Old City Hall. On review aggregator website Rotten Tomatoes, the film holds an 85% approval rating, based on 255 reviews, with an average rating of 7.96/10. The website's critical consensus states: "A rousing and energetic adaptation of the Broadway musical, Chicago succeeds on the level of pure spectacle, but provides a surprising level of depth and humor as well." On Metacritic, the film holds an average score of 82 out of 100, based on 39 critical reviews, indicating "universal acclaim". The cast received widespread acclaim for their performances. Tim Robey, writer for The Daily Telegraph in the United Kingdom, labeled Chicago as "The best screen musical for 30 years." He also stated that it has taken a "three-step tango for us to welcome back the movie musical as a form." Robey said "This particular Chicago makes the most prolific use it possibly can out of one specific advantage the cinema has over the stage when it comes to song and dance: it's a sustained celebration of parallel montage." Roger Ebert gave the film three-and-a-half stars out of four, calling it "Big, brassy fun". However, other reviews claimed that there were issues with the film being too streamlined, and minor complaints were made toward Marshall's directing influences. Chicago, along with the 2001 musical Moulin Rouge! and the hip hop centered film 8 Mile in 2002, is widely considered to be responsible for ushering a re-emergence of the musical film genre in the 21st century. Following the success of Chicago, many musical films have been released in cinemas, with several adapted from stage productions for Broadway and London's West End, including Phantom of the Opera, The Producers, Rent, Dreamgirls, Hairspray, Sweeney Todd: The Demon Barber of Fleet Street, Mamma Mia!, Nine, Les Misérables, Rock of Ages, The Last Five Years, and Into The Woods. The 2013 Scottish film Sunshine on Leith was also adapted from a stage production, originating with Scotland's Dundee Reperatory Theatre. The revived interest in musical films has also brought remakes or sequels to earlier films, including Beauty and the Beast in 2017 (a live-action adaptation of Walt Disney Pictures' 1991 animated feature, itself adapted for Broadway in 1994), and the 2018 films Mamma Mia: Here We Go Again! ( a sequel to 2008's Mamma Mia! ), A Star Is Born (a fourth version of the film following earlier productions in 1937, 1954, and 1976) and Mary Poppins Returns (a sequel to 1964's Mary Poppins). Notable original musical films have also been released to critical and commercial success since Chicago's cinematic run, including Once in 2006, Enchanted in 2007, and La La Land in 2016. The Greatest Showman was released to commercial success with mixed critical reception in 2017. Many of Chicago's cast and crew have also gone on to work in succeeding musicals, including director Rob Marshall (Nine, Into The Woods, Mary Poppins Returns), writer Bill Condon (writer/director for Dreamgirls, director for Beauty and the Beast, writer for The Greatest Showman), costume designer Coleen Atwood (Sweeney Todd: The Demon Barber of Fleet Street, Into The Woods), and actresses Catherine Zeta-Jones (Rock of Ages), Queen Latifah (Hairspray) and Christine Baranski (Mamma Mia!, Into the Woods). ^ "CHICAGO (12A)". bbfc.co.uk. British Board of Film Classification. December 12, 2002. Retrieved March 6, 2014. ^ "Chicago (2002)". Box Office Mojo. Retrieved March 6, 2014. ^ Mitchell, Elvis (December 27, 2002). "Movie Review: Chicago (2002)". The New York Times. Retrieved March 7, 2014. ^ "Go-to-Hell Kitty from Chicago Summary & Breakdown - StageAgent". ^ Glenn, "Chicago" in Movie Musicals: from Stage to Screen. ^ "Chicago Reviews & Ratings". IMDb. ^ Nichols, Peter M. (August 15, 2003). "Adding a Song To 'Chicago'". The New York Times. ^ "Chicago (2002)". Rotten Tomatoes. Fandango Media. Retrieved April 8, 2019. ^ "Chicago Reviews". Metacritic. CBS Interactive. Retrieved February 27, 2018. ^ Robey, Tim (December 27, 2002). "This Jailhouse Rocks". The Telegraph. London, UK. Retrieved November 17, 2009. ^ "Chicago (2002) - Cream of the Crops". Rotten Tomatoes. Retrieved June 5, 2009. ^ O'Connell, Sean (January 21, 2003). "Chicago". Filmcritic.com. Archived from the original on June 21, 2008. Retrieved November 18, 2009. ^ a b "Chicago (2002)". Box Office Mojo. Retrieved March 6, 2014. ^ "Top Grossing Movies That Never Hit #1 at the Box Office". Box Office Mojo. Retrieved July 18, 2010. ^ "The 75th Academy Awards (2003) Nominees and Winners". oscars.org. Retrieved 2011-11-20. ^ "The 2003 Oscar Winners". Ropeofsilicon.com. Archived from the original on August 6, 2009. Retrieved August 10, 2009. ^ "Awards Database - The BAFTA site". Bafta.org. Retrieved August 10, 2009. ^ "The 2003 Golden Globe Award Winners". Ropeofsilicon.com. Archived from the original on December 8, 2009. Retrieved August 10, 2009. ^ "The BFCA Critics' Choice Awards :: 2002". Bfca.org. Archived from the original on February 25, 2011. Retrieved August 10, 2009. ^ "O.F.C.S. : The Online Film Critics Society". Rotten Tomatoes. January 6, 2003. Archived from the original on January 24, 2010. Retrieved August 10, 2009. ^ "The 2003 Screen Actors Guild Award Winners". Ropeofsilicon.com. Archived from the original on January 22, 2009. Retrieved August 10, 2009.